In the late 1860s the U.S. federal government initiated the most abrupt transition from slavery to citizenship in the Americas. The transformation, of course, did not stick, but it did permanently alter the terms of American citizenship and initiated a century long struggle over the place of African Americans in the American polity. Southern Progressives, crucial in this account, were faced with a significant ideological challenge: how to reconcile their liberal principles with their commitments to racial hierarchy. The ideological work performed by Southern Progressives was instrumental to the establishment of white supremacist institutions in the heart of a putatively liberal democracy and illuminate how combinations of liberal and illiberal principles have affected the history of American political thought. In this work, Marek Steedman demonstrates how Southern Progressives combined commitments to liberal, even democratic, politics with equally strong commitments to the maintenance of racial hierarchy. He shows that there are systematic features of the traditions of liberal and republican thought, on the one hand, and ideologies of race, on the other, that facilitate their combination. 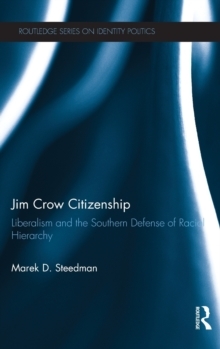 Jim Crow Citizenship relates familiar developments in American state-building, legal development, and political thought to race, thus showing how race intertwines with these developments, often shaping them in decisive fashion.